Section to platoon level modern ground combat rules rules written by Matthew Hartley, Michael Baumann and Steve Blease for use with 20mm or 28mm miniatures. 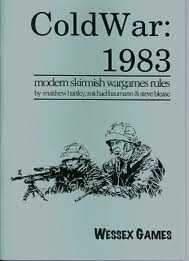 ColdWar: 1983 is a set of skirmish wargames rules primarily designed for section and platoon level actions between NATO and Warsaw Pact troops using 20/28mm scale miniatures. That said they can be used for pretty much any historical skirmish action of the last fifty odd years, as well as fictional post-apocalypse scenarios. The rules focus on the motivations and training of the individual soldier and the 'friction' that occurs on the battlefield to provide a realistic but easy to play recreation of late C20th warfare. Despite the focus on the man in the uniform, Cold War: 1983 also contains comprehensive weapons listings - both small arms and vehicles, as well as TO&E's for British, U.S. and Soviet units of the period. The driver behind this release has been the increase in availability of high quality 28mm scale moderns, notably the 1980's lines from the likes of Mongrel, MoFo and TAG, as well as the vehicles from Sloppy Jalopy, and a gap in the market for an easy-to-play but realistic set of rules for them. Includes: TO&E’s for British, Soviet and US units of the period; Statistics for 20 different small arms and 18 vehicle mounted weapons and Game profiles for 33 different types of vehicles from a dirt bike to a Challenger MBT. Pages: 28 A5 inc cover.